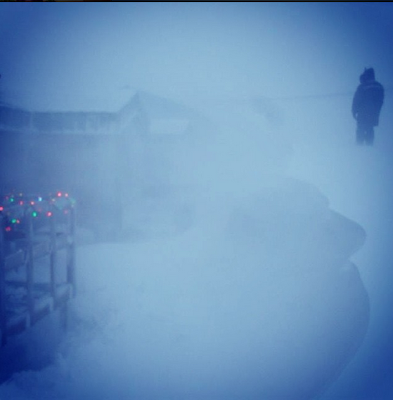 Last week, Western Nunavut just experienced the biggest blizzard its seen in years. It started on Tuesday and lasted until Friday. Not only were the government offices and schools shut down, but even the grocery stores closed, which means people went without water delivery or access to groceries for days. 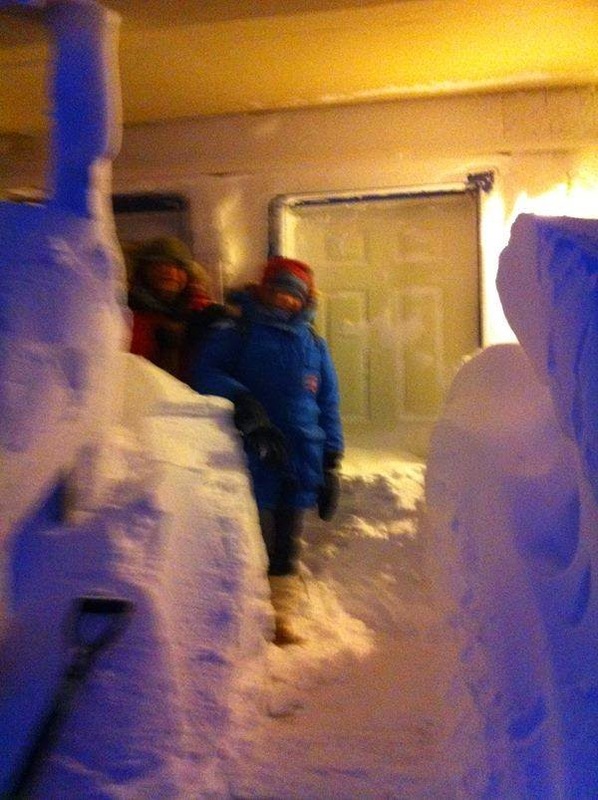 The snow drifts on the roads built up to incredible heights, and coated the houses with an impressive fortress of snow. 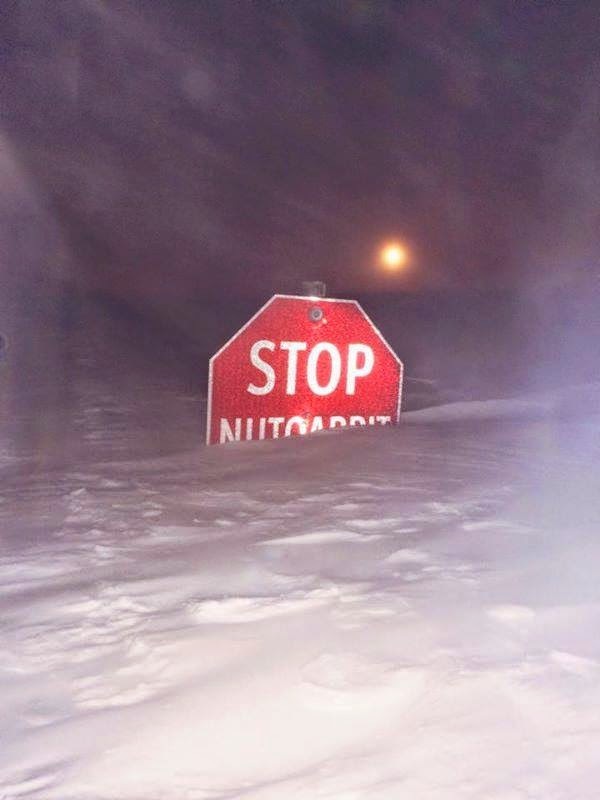 We were really lucky, as instead of being in Cambridge Bay during the blizzard, we were "stranded" in Yellowknife, unable to fly home to Cambridge Bay while the blizzard still raged. 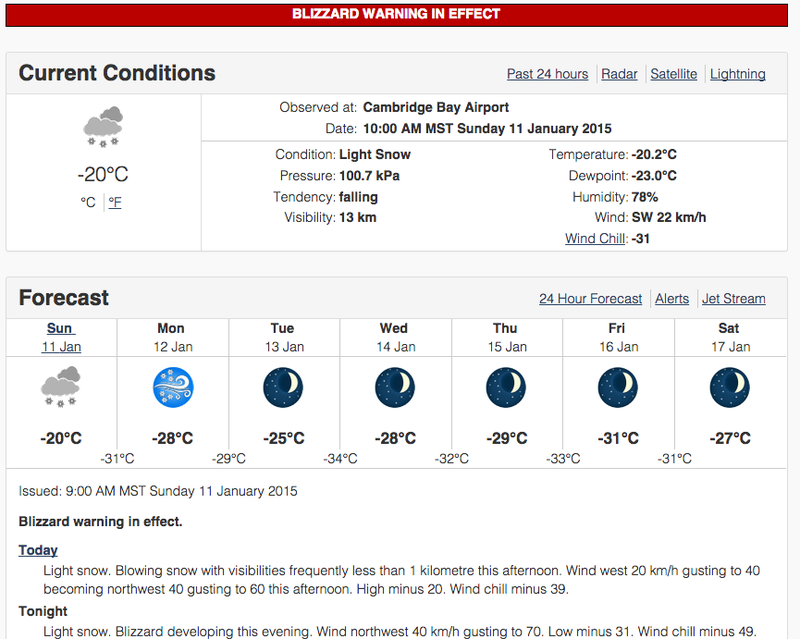 From Monday to Friday, we had to wait at the hotel in Yellowknife for the weather to clear. But it wouldn't be entirely accurate to say that we suffered while we waited. We'd wake up in the morning, go for breakfast in the hotel restaurant downstairs, and then lounged in our room watching TV. In the evening, we'd come down to the lobby bar in time for happy hour (read: free food and cheap drinks). By the time we finally checked out, the bartender knew us by name, by face, and our favourite drinks. After a while, I wondered if this was what life would be like, living in the retirement home we used to work in. So...yeah, it wasn't terrible for us. You can see more incredible photos from CBC here, as it apparently made front page news in the country. 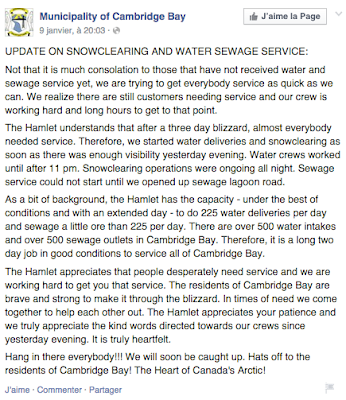 Somebody on Facebook commented about how people in every community must dream about having a regular water system, "that way when it blizzards you can use that extra time to catch up on the laundry, take a long hot bath, wash the floors and dishes, etc., instead of measuring every drop hoping it will last you through the blizzard." When you constantly have to worry about whether you'll run out of water, it changes everything. 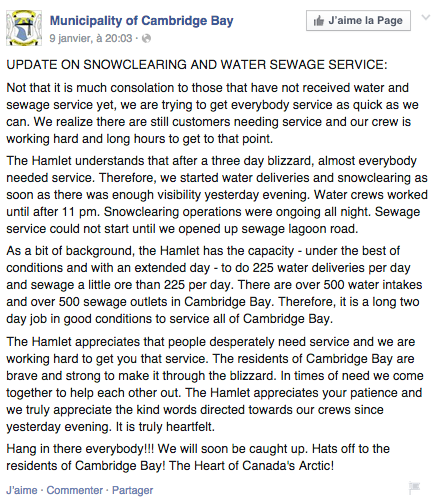 Eventually Environment Canada declared that the blizzard alert was over, and the water delivery trucks began running again. The trucks hit the road to start clearing the snow, and the offices and schools opened again. And the weather let up, a little, just long enough for us to be able to land our plane. After several days of cancelled flights, there were many reunions at the airport. Families together again, folks trying to leave on vacation finally able to leave, folks trying to get back from vacation (like me) finally able to return. And mail! And eventually, groceries! Just in time too. The shelves at the grocery stores were looking pretty bare. After the blizzard is not the best time to go grocery shopping - when I went to go pick up some vegetables, all I could find was carrots and a red pepper, ready for retirement. The dairy section was pretty empty...except for cheese, so that was all right. Going home wasn't easy though. 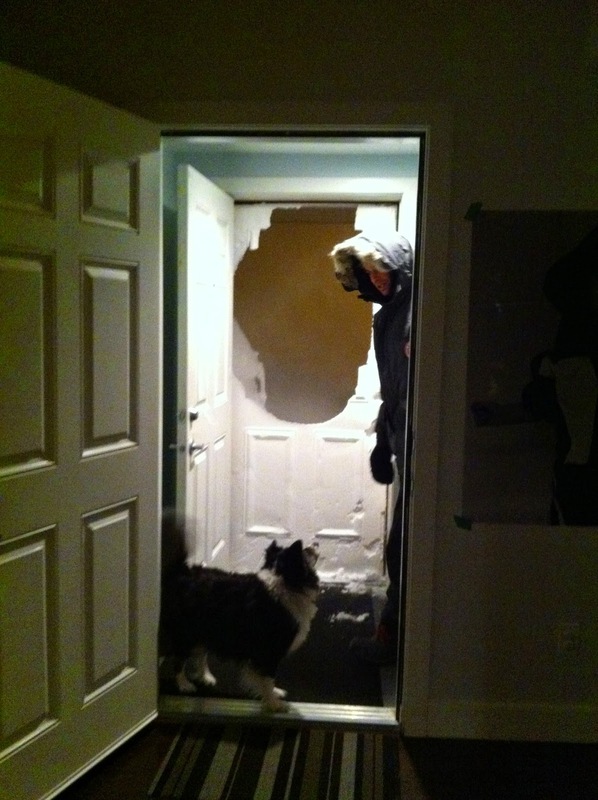 We had to practically break into our house - digging through the snow that had piled up and packed against our front door. 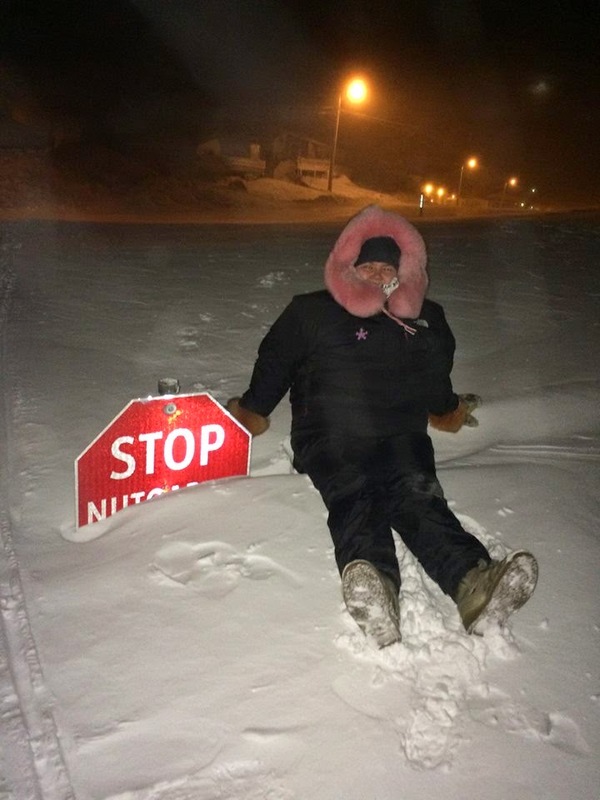 Of course, the blizzard conditions didn't stop some folks from having adventures. Here we go again. Time to stock up on food, candles, water, and board games. 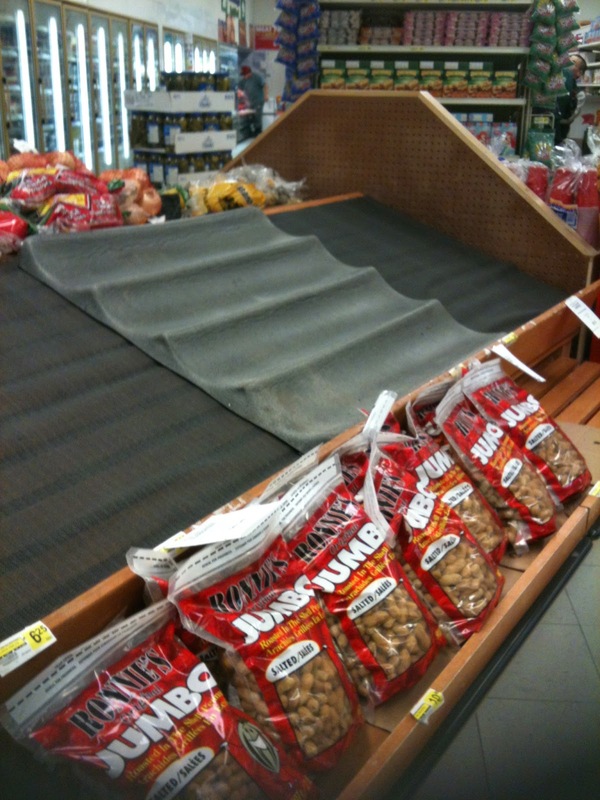 another blizzard is expected to hit Cambridge Bay, so just in case I stocked up on supplies of food we can eat without electricity or water. There wasn't much selection in produce, and canned goods are pricey! This pile came to $57.